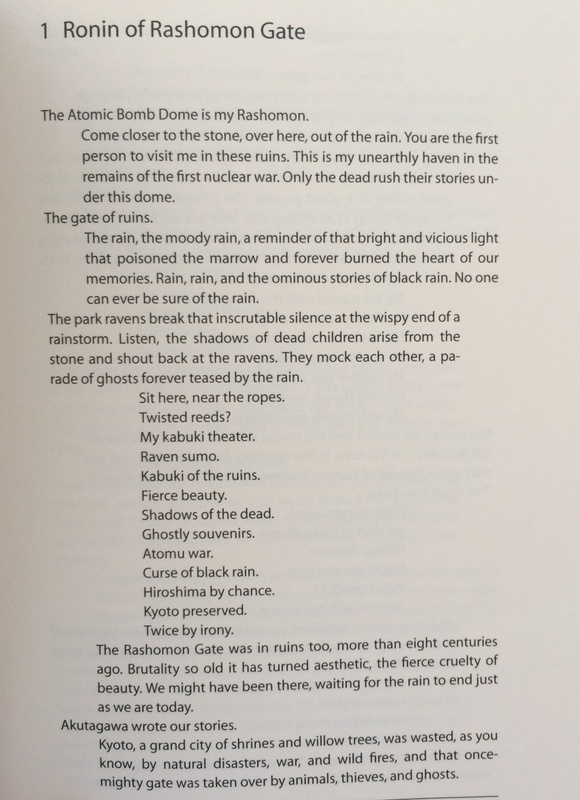 Hiroshima Bugi, by Gerald Vizenor, was introduced to me through my professor for one of my exchange classes, Contemporary Japanese Literature. The whole class is about reading Japanese science fiction and then breaking them apart and thinking about how it deals with society and life, but I have no idea now for which story Hiroshima Bugi was used as an example. I only know that, when it was put up on the screen, the format, the writing style, the content was so very innovative, so original, that I wanted to read more. So naturally, being a fanatic reader, I asked my professor where I could find the book so I could read the rest. It turns out that it got a super limited print because it was an independent publication by a university press (the University of Nebraska), and somehow or other a copy landed in the hands of my professor, so I ended up borrowing the book to read. And the read was so worth it. To be honest, when I read that first page in class, I thought the work was an independent poem, and not the opening to an entire novel. The novel separates its paragraphs using indents, and the third indent is always used throughout the novel for direct dialogue, where the speakers alternate lines and the speech is short, staccato and symbolic. And the most amazing thing was, the writing style is so experimental that I assumed the book was a translation from Japanese, but no. The author is American, and so the book was already in English. The book itself is a novel written with alternating chapters between two voices. The first part is written through the eyes of Ronin Browne, a half Japanese half Native American who recounts the history of Japan using a mainly autobiographical style from the moment of the first atomic bombing, and keeping Hiroshima as its focal point. The second half is written by Manidoo Envoy, a friend of Ronin’s father, and the one who gives explanations to what Ronin is doing, what historical references we need, and what background story to which character we need to know more of to understand what is going on. His chapters are written more conventionally, and without his voice, I think the whole book would become super pastiche and experimental and not an approachable read at all. Ronin’s sections are very poetic, Manidoo very factual. They are so contrasting, but the author has done such a great job on interweaving the two voices together that I didn’t feel any sense of misplacement whilst reading the book. However, the content is quite heavy, and even though things are explained to you, it is not a leisure book. I’m pretty sure that I fell asleep quite a few times reading this book simply because it takes concentration to read. Although the language isn’t particularly complex, the density of the content meant I couldn’t just skim over the paragraphs and understand what was going on; I really needed to focus on the words. Regardless, if you manage to find it sometime, this is definitely worth dedicating a few days of your life to read. Even if only to marvel at how the author has crafted each sentence in Ronin’s sections to show so many things in minimal words.